Our family of 6 adults and two babies had a wonderful time at the Oxford Beach Cottage. Lots of room for visiting, eating, relaxing, napping, exercising, and sleeping. The best feature of course was the bay in the backyard! The beach was sandy, the water was warm. We cooked out, sat by the firepit, rinsed feet at the outdoor shower, and took leisurely strolls. The city park was a great location for family portraits. Nearby Easton had a convenient Target and nightlife if needed. St. Michael's had the colorful shops and great restaurants. Renting was easy - key pick up at the rental was ideal. It was a very good family vacation. I think the cost to rent the house is too high. I rented a 4 bedrm. place in Rehoboth for one week for almost the same cost. The property location was perfect. We spent much of our time fishing and crabbing from the dock. The cottage is carpeted in the photos. When we arrived we discoverd the carpeting had been removed exposing the hardwood floors, making it difficult on my older dog. However, it was a great vacation and a nice place to stay. This house was very nice. Location and view was wonderful. Bedrooms were a little stuffy due to not large enough AC for summer high temps. Overall it was a nice place and we would stay again. For the price, I expected a house in a little better condition. The owners need to do some work inside the house and provide a decent set of knives that are usable! Other than that, there were some very nice amenities in the house and, of course, the view was phenomenal. We had a great time. The house was just what we expected. When we arrived there were several bags of stinky garbage sitting by the garage. When the trash collection service did not get them the next morning, ESVR sent someone out to get it and it was gone by that afternoon. We really appreciated their quick response to the problems. They brought us a DVD player on our first night since they guaranteed that there would be one there. We had a great time and enjoyed getting away. We loved almost everything. We just weren't prepared for all the critters (saw a snake right by the back door and then a dead bunny in the back yard - we think the snake killed it :() and bugs (ticks especially). Also, the guest toilet was clogged. We also couldn't figure out how to turn the lights on the pier on - thought maybe they didn't work. But loved the location and having the pier to ourselves!! All was very nice except the carpet condition in the dining area... quite a few stains. We thoroughly loved our stay at the Oxford Cottage. The house was perfect for us and our 4yr old lab who swam the entire time we were there. We particularly enjoyed the porches on the back of the house and the gorgeous views of the water. We had a wonderful long weekend at the Oxford Beach House! We only wished we had booked a longer stay. The views from the house and dock are amazing and it was such fun (especially for our Golden Retriever)having our own beach! Can't wait to go back! House was very clean, except some stains on the carpet. We travelled with three children (11,7,1) and we enjoyed the clean and sandy private beach. The water was clean and the kids took a lot of swims. The location was great for us, because we could go to the beach even when our baby took a nap. We would come back. House was wonderful. The kids enjoyed the beach. We enjoyed the fabulous sunsets and local Ice cream. The house's location is wonderful and the waterfront view is spectacular. It needs a little maintenance, though. The staff at ESVR is extremely nice and helpful which is why we chose to rent from your company. One minor problem is that I signed up to receive an automated phone call when the house was ready but I never received it. Our family stayed at the Oxford Beach Cottage for 4 nights in late October. The location is fantastic, with a gorgeous small white sandy beach on a section of the river that has a wide view, but fairly calm water. We spent many hours on the beach while our toddler explored the sand and discovered all manner of shells and rocks, and our dog swam after sticks and played in the sand. The small grassy yard was also a great play area for both of them while we looked on from the Adirondack chairs. The house is a very short walk to Causeway Park, which has a small play area overlooking the harbor, but we chose to walk a little farther to the town's waterfront park at the foot of Market Street, which has a great view, a nice set of play equipment, and dogs are welcomed. We were somewhat disappointed with the cheap motel-style towels that were provided, although the rest of the house was very nicely appointed. The house was not quite as clean as we expected, with a fair amount of dust build-up on ceiling fan blades and on some of the higher horizontal surfaces, and the newly exposed hardwood floors are very nice, except that most of the carpet nails have not been removed and are protruding along the walls. That said, these issues were very minor compared to all the positives about this house and the wonderful time we had during our short stay there. Nice location, but property not cared for very well (yard, dock, outdoor furniture, cushions very dirty, etc. )Carpet needs cleaning, and bugs and dirt found around the baseboards...not vacuumed very well. No kitchen trash can. Phone in house did not work. Not much beach, but enough to put a couple of chairs and cooler. Enjoyed the area, some good restaurants and very pretty. Will be back, but will try other accommodations. Not terrible, but just not up to our standards. Good place for a family with kids. We came with our dog, and she enjoyed it. A fabulous week. Just the right mix of things to do and doing nothing. 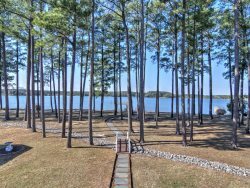 Osprey point is a wonderful location - 180 degree water views and close to St. Michaels. Pool and deck were nice but pool is smaller than it appears in photos. Where it fell really short was in the kitchen - old appliances, gas range with only 2 burners working, dishwasher on its last legs that died the 2nd time we used it - definitely needs some upgrading there. The gas grill was filthy. Also the cleaners were late in getting the house ready, and didn't have all the required linens until later in the day - 4pm check in is rather late to begin with, so to have to check in after that is unacceptable given the cost. All in all a nice vacation spot but with some issues that made it less than perfect. MANAGER RESPONSE: Thanks very much for the review and we are so glad you enjoyed your stay despite a few hiccups. We delivered a 2 burner stove top to help make up for the two burners on the stove that did not work and had the dishwasher repaired, as well as the stove, immediately following your stay. I am very sorry you experienced a later check-in on 8.23. While it is our goal to get everyone in property by 4pm, sometimes on high-volume turnover days it may take a little longer. While this instance is extremely rare, we again apologize. We enjoyed the beautiful location, with comfortable lawn chairs pulled up to admire the view and to watch the ospreys and blue herons wheeling by. The house was perfect for a grandparent/ parent,baby, aunt visit, enough rooms and beds spread out into two separated wings.We rented kayaks and also used the canoe that was provided. Paddling was easy and lovely. The swimming pool was much smaller than the photo in the literature would suggest, but we only dipped out feet so it didn't matter much.We had only two complaints, one serious. In the middle of the night before our last day, the property was noisily, unexpectedly sprayed against mosquitoes. Even though bug spraying was mentioned in the rental literature, this was a frightening experience. We were not notified in advance, our windows were open, it was an alarming noise, and we worried about our toddler and our pregnant daughter. We spent the next morning looking up the chemicals used and debating whether to leave a day early. We kept the dogs off the lawn and in the house, a real inconvenience.The other issue is just a suggestion. We enjoyed cooking at home and using the barbeque. We brought plenty of food with us but not a whole cabinet of spices, and the only spices available at the rental house were salt and pepper. It would be more hospitable in an upscale rental to include spices, which we have found in other venues. Also, there were no broom, dustbin,mop, vacuum cleaner or kitchen sink supplies adequate for normal everyday clean-up. We were surprised that we were expected to put away the last load in the dishwasher, given that the departure timing made this very tight, and "washing out the frig" should be included on the list for the housekeepers.That said, we enjoyed our time at Osprey Point. MANAGER RESPONSE: Thank you very much for the feedback! We apologize that you were frightened by the mosquito sprayer. They are part of life here on the shore and spray at night so as not to disrupt people during the day. The County contracts with HOA's and schedules may vary so we are unable to notify guests of when this spraying may occur. As for spices, we do not ask our housekeepers to remove the spices from the property, but we do not provide them as peoples wants/needs may vary. We ask that all the food be removed from the fridge upon departure so that our housekeepers can clean the refrigerator between guests. Thanks again for your review and we hope to see you back on MDs Eastern Shore! We enjoyed our stay at Osprey Point. It's a very lovely location.